I enjoy listening to worship music, when I'm in the right mood for it. I love Lauren Daigle, Matt Redman, Chris Tomlin, etc. So, when I was given the opportunity to listen to a new worship CD from Passion Music, I took it. From what I've been told, Passion Music is "rooted out of the Passion movement, and is committed to leading people towards renewed intimacy with God and fresh encounters of worship." It includes a group of worship artists who sing together at live Passion Conferences, such as Kristian Stanfill, Sean Curran, Melodie Malone, Crowder, and Matt Redman. 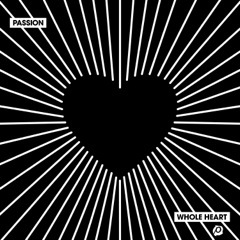 The most recent Passion Conference was held in Atlanta, Georgia, which birthed the new live album WHOLE HEART. I have been listening to a digital version of this music while I work on my laptop and have been enjoying it. I will also be receiving a physical copy of the CD later in March, which I'm looking forward to. And, guess what?! I have the option to give away another copy of the CD to someone who follows my blog! Back in October, I said I was going to stop doing giveaways but, as I've thought about it more, I decided I would still like to offer a few giveaways throughout the year, in order to bless some of my readers. But I'm going to be handling them differently than before - no more online forms that collect personal information. For THIS specific giveaway, if you want to be entered into the random drawing, all you need to do is be sure you are following "He Holds My Right Hand MINISTRIES" on Facebook. Just hit the "like" button on the page when you are signed into Facebook (or, there is a LIKE button on the left side of this blog, if you choose to use that). If you are already following the page, then you don't need to do anything. You are already entered! Next Wednesday, February 21st (no sooner than 8:00 p.m. Central Time), I will assign a number to each follower of "He Holds My Right Hand MINISTRIES," then use Random.org to choose a number for me. If your name is chosen, I will contact you via a private Facebook message, and you will have 48 hours to respond. If no response, I will choose another number. NOTE: Giveaways are open to continental U.S. residents only. The new WHOLE HEART digital album will be released on February 23rd. Here is the link where you can purchase at that time: PASSION: WHOLE HEART. The physical CD will be available in March.